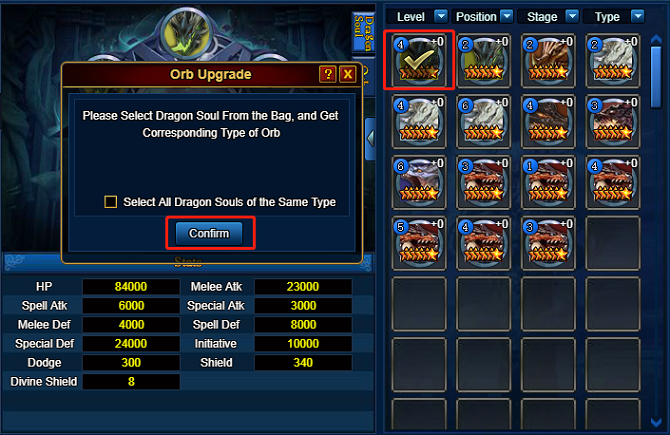 Dragon Soul Orb can replace a certain amount of same type Dragon Souls to activate Dragon Soul Suite Bonus. 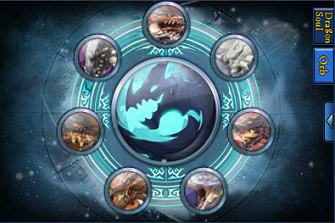 High level Orb can replace more Dragon Souls, and can replace 6 Dragon Souls at most to acquire the exclusive 6-suite attributes of Dragon Soul Orb. 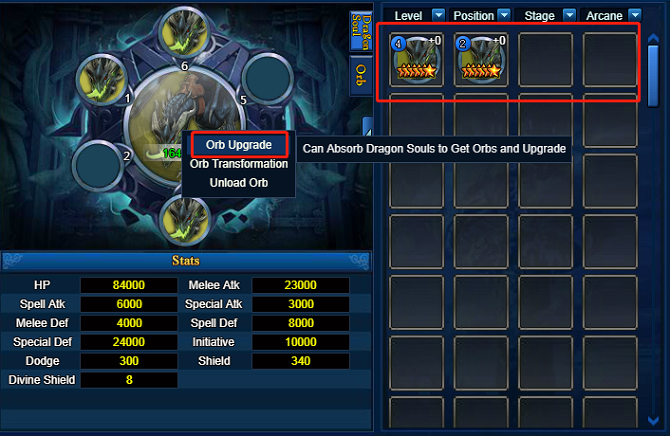 Click the matrix in the centre of the Dragon Soul interface and choose Orb Upgrade to absorb a certain type of Dragon Souls to acquire the orb of corresponding type. Dragon Souls being absorbed will vanish after they become the orb. The level and experience of the Dragon Souls will become the Orb experience proportionally. Dragon Soul Orb can be upgraded through absorbing Dragon Souls of the same type. High level Orb can replace more Dragon Souls. 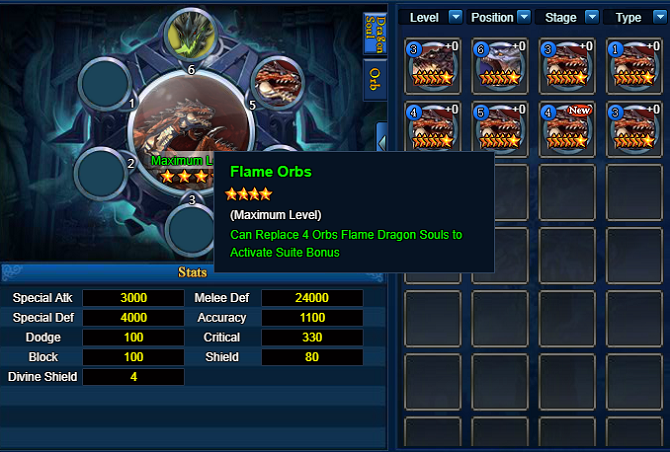 After equipping, the Orb can replace a certain amount of Dragon Souls to increase the Suite Bonus. For example, After equipping 1-star Arcane Orb, two Dragon Souls Suite Bonus can be acquired through equipping an Arcane Dragon Soul. 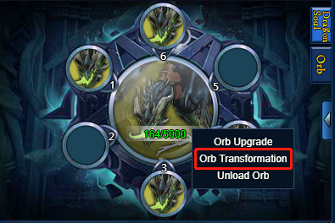 Players can click the Orb and choose Orb Transformation to transform the Orb into other types if you are not satisfied with that. The star level will be kept after transformation. Each transformation will cost a certain amount of gold. Higher level Orb will cost more gold. 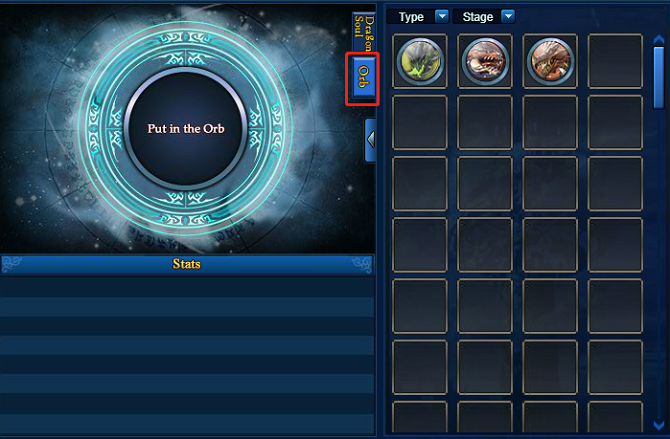 Tips: Unload the Orb will lose the Suite Bonus provided by the Orb, and the Suite Bonus can be regained by reequipping the Orb. Excessive Orbs can be recycled and players can get a certain amount of Silver after recycling. Tips: The recycle operation can’t be withdrawn, please be cautious about that. Previous>Introduction of【Faery】	Next>Artifact: Epic-Arms of Elemental God! Special Effect Reverse War Situation!